Door said “of the Savages”. Wood, forged iron. 17th century. While our town was surrounded by woods, attacks by Native Americans were a serious threat. This door led directly to the woods and protected our community against any intrusion, especially during the night. For this reason, two security measures were integrated into this door. 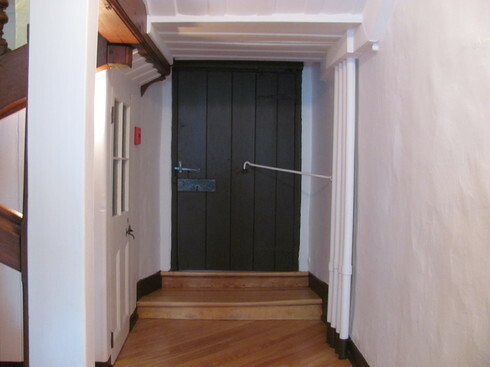 First, the door is constructed of two thick wood planks. The first is oriented horizontally and the second is oriented vertically, for reinforcement. You will also notice the solid iron bar anchored directly in the stone wall. It can be used to bar the door and preclude attempts at entry. It still stands as a symbol of the turbulence of everyday life in New France. Today, this door leads to the school.